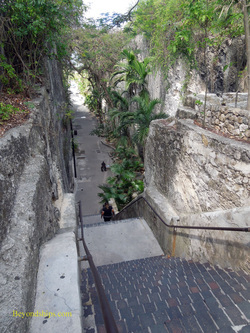 The Queen's Steps is one of Nassau's more famous sites. It is a 102-foot high staircase with 65 steps (originally, there were 66). 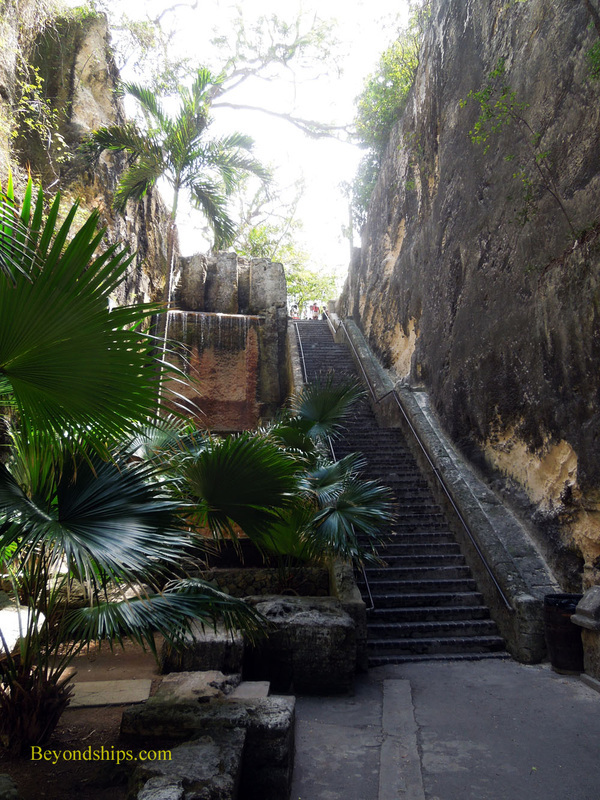 Slaves carved the steps out of limestone between 1793 and 1794. A century later, the stairs were renamed in honor of Queen Victoria and her role in ending slavery in the Bahamas. At the top of the hill near the steps is the Water Tower (right). For a fee, you can ride an elevator to the top 216 feet above sea level for a view of the town and harbor. 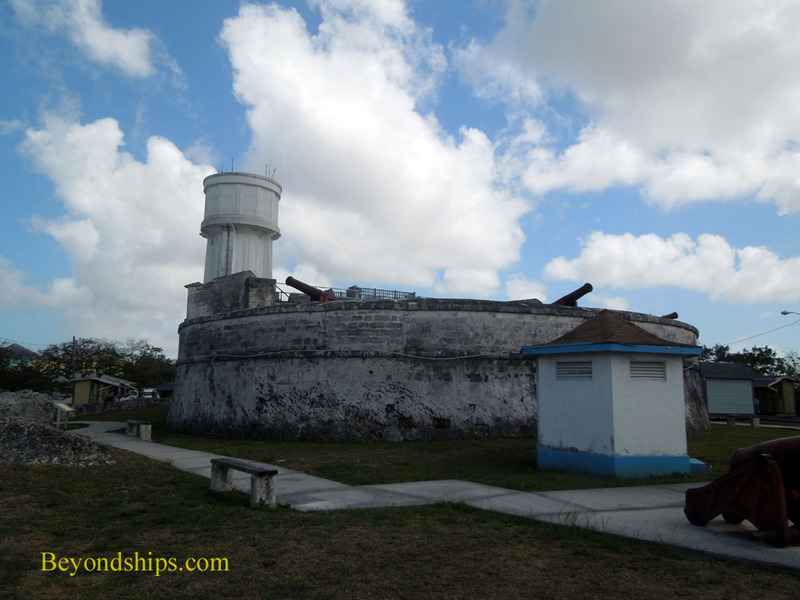 In the shadow of the Water Tower is Fort Fincastle, a battery built to protect the harbor by the governor of the island, Lord John Dunmore, in 1793. It also acted as a lighthouse and later a signal tower. 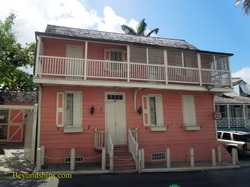 Balcony House on Market Street dates from 1788 and is the oldest wooden house in Nassau. It was once in-town home of American heiress Josephine Bryce. The house has been restored and is open to the public as a museum. The Magna Carta Court Building on Parliament Street is one of the few examples of stone-exposed building in Nassau. Government House, atop Mount Fitzwillliam, is the official residence of the Governor General of the Bahamas. 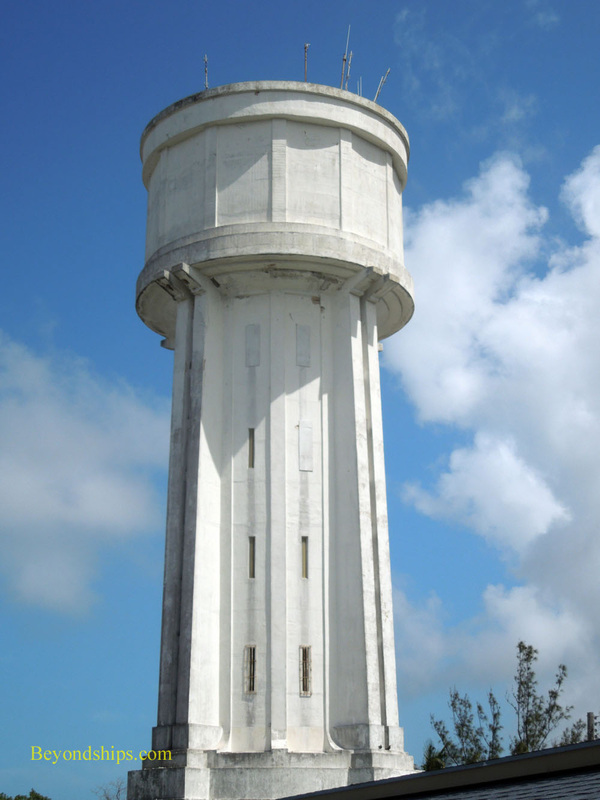 Part of it is also used by the Royal Bahamas Defense Force. Built in 1803, the house is an impressive example of Georgian era neo-classical colonial architecture. 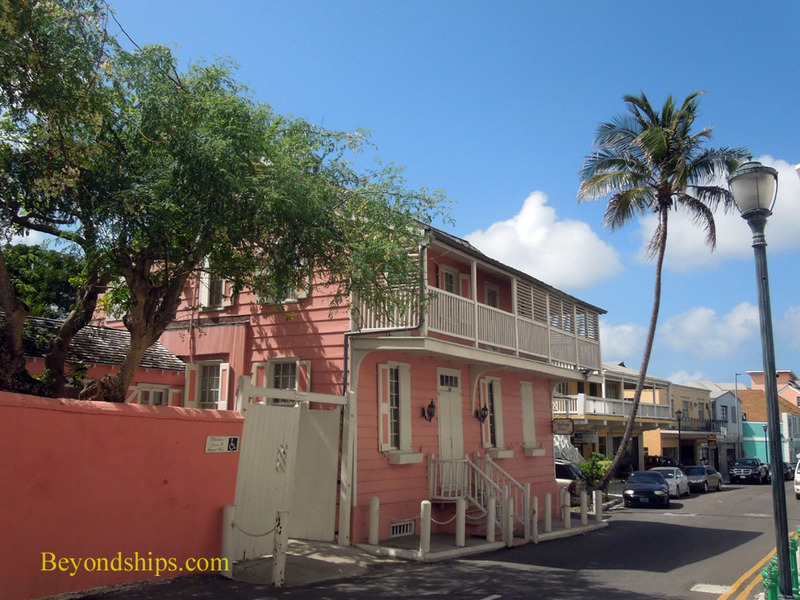 Its unusual pink color reflects the influence of the island. Partially destroyed by a hurricane in 1929, it was extensively renovated for the Duke of Windsor (the former King Edward VIII) who was governor general during World War II. Every other Saturday at 10 a.m. the Defense Force, accompanied by the Royal Bahamas Police Force Band, conducts a changing of the guard ceremony at Government House. 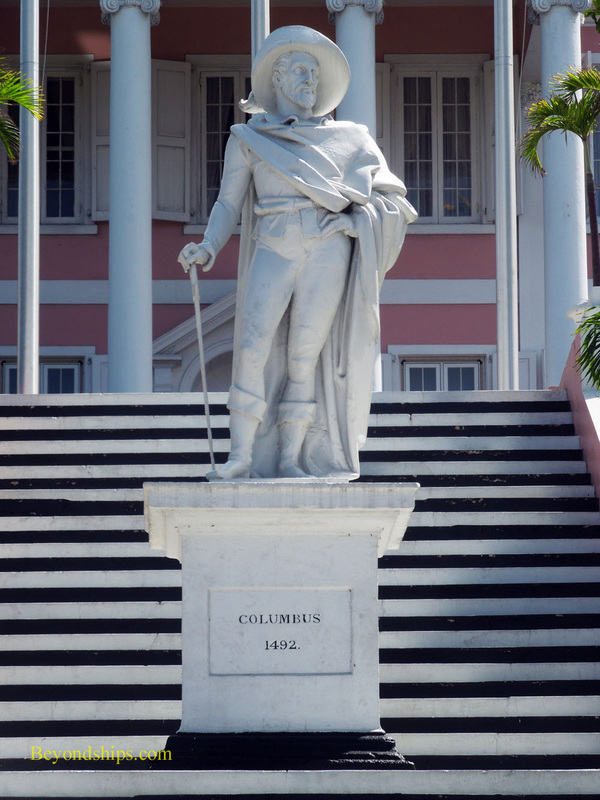 The statue on the steps is of Christopher Columbus, whose first landfall in the New World is believed by many scholars to have been in the Bahamas. It was carved in London and was placed in front of Government House in 1830. Down the hill from Government House is the Nassau Public Library (left). 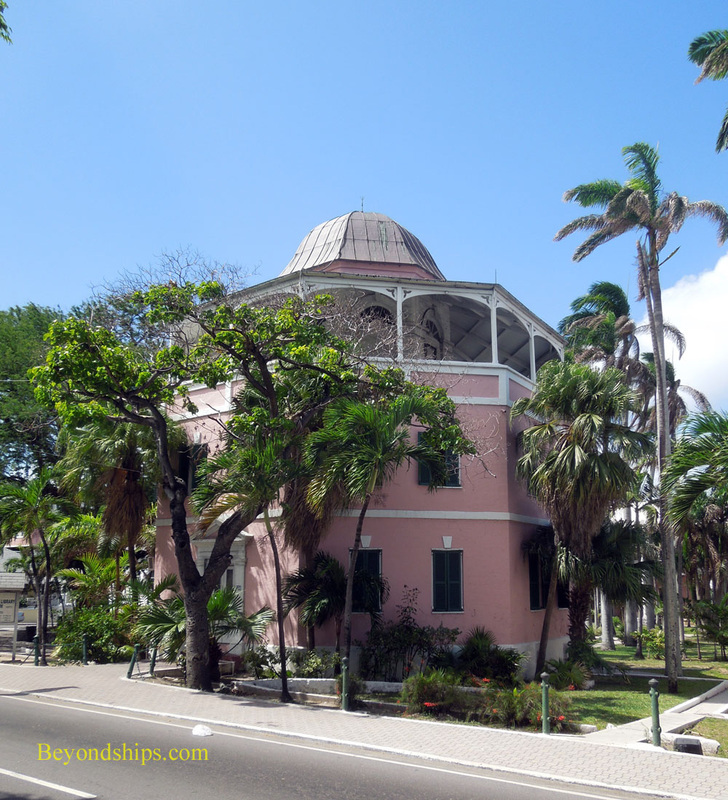 This octagonal building completed in 1798 was originally a jail. 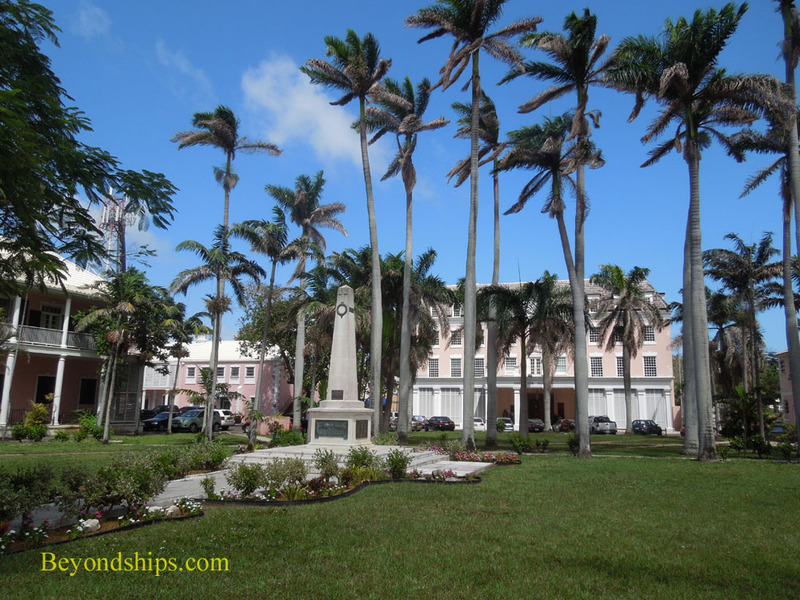 Near the library is a park with the Centotaph, a memorial to the Bahamians who fought in the two World Wars (above). Bordering the park is the Supreme Court Building, which was begun in 1921. The Bahamas follow the British legal tradition of having lawyers and judges appear in court in wigs and robes. 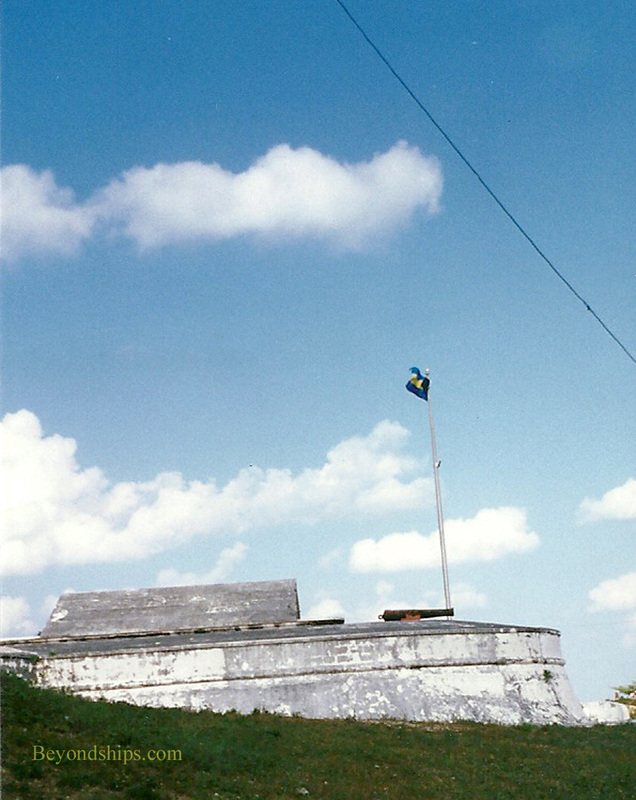 Another fort that is open to view is Fort Charlotte, named after the consort of King George III. It too was built by Lord Dunmore to protect the harbor. As a result, it offers a fine view of the harbor. The fort itself has a number of colonial era cannons, a dry moat, draw bridge, ramparts and a prison. 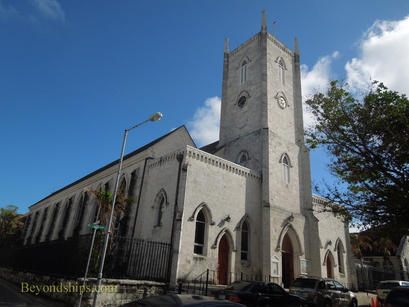 Christ Church Cathedral (left) is an Anglican/Episcopal church built between 1837 and 1845. It has stained glass windows, mahogany work and an organ. 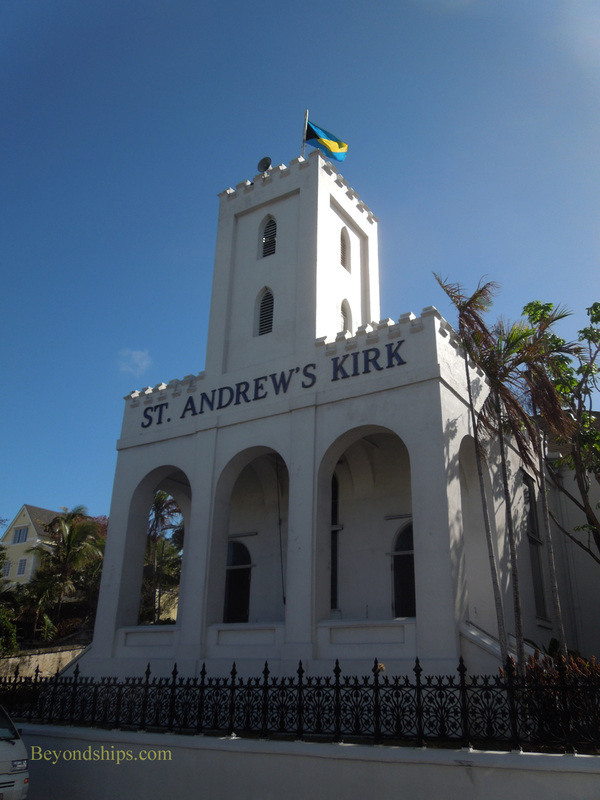 Other historic places of worship in Nassau include St. Andrew's Kirk (right), which dates from 1810. 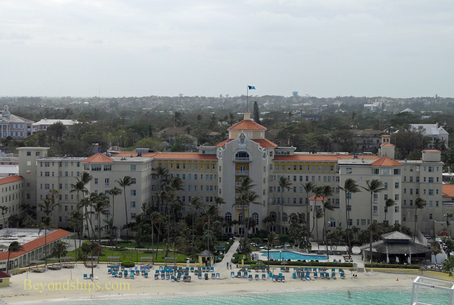 Even if you have never been to Nassau, you may well have seen the British Colonial Hilton Hotel before. It was used as a set in two of the James Bond films (Thunderball and Never Say Never Again). Built in 1922 and renovated in 1999, the hotel has a traditional British colonial atmosphere. For a fee, non-residents may use the pool. The beach is next to the harbor.